Senior Emma Ahlert created the position of Advocacy Fellow to foster more of a conversation about healthy relationships and sexual assault on campus. Photo courtesy of Emma Ahlert. 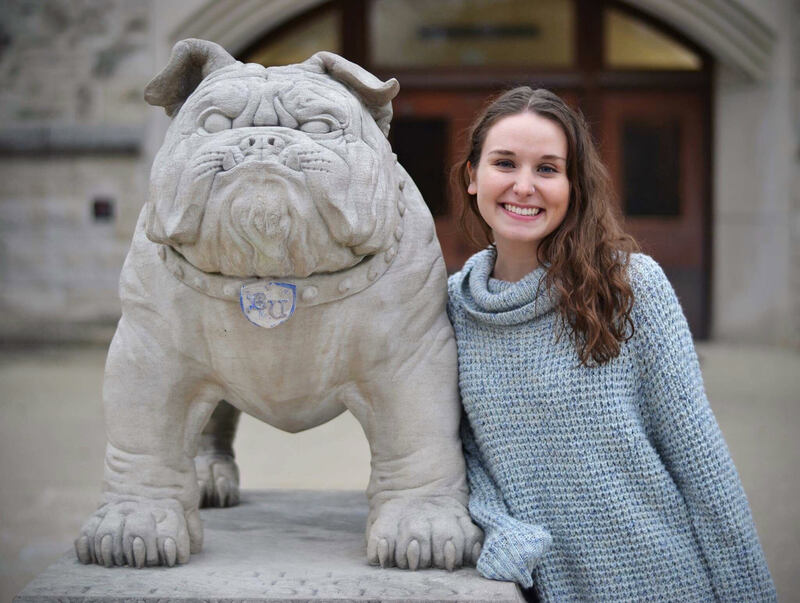 Emma Ahlert, a senior arts administration major, created and took on the role of Butler University’s advocacy fellow this fall. After talking to Sarah Diaz, associate director of health education and outreach programs, Ahlert learned more about the Office of Health Education and Outreach Programs’ efforts regarding healthy relationships and sexual assault. She created the fellowship to further communicate these efforts across campus. The Butler Collegian: When did your passion for healthy relationship advocacy begin? Emma Ahlert: I would say probably during my first year at Butler. I was in a bit of a tough relationship, and so I met with Sarah Diaz. So through her mentorship, through Alpha Chi [Omega] and our domestic violence awareness philanthropy, and through my own experience and the great faculty at Butler, I cultivated this passion. TBC: So you felt like you had support here but still felt like there was a need for this role to be filled? EA: When Sarah met me my first year, she identified me as a leader on campus and led me to the One Love Escalation workshop. I led those for quite a bit. I really felt empowered through those and facilitated eight or nine of those workshops for basketball, football and golf. I would stand in front of these teams and talk about healthy relationships and what each of them deserves. I was able to be a resource on campus. It was not so much that I thought there was this big problem, I just loved what I was doing. I facilitated quite a bit my sophomore and junior year, then came up with this idea my junior year. I thought, ‘How could I make this more of a presence or position?’ I just felt like I have the passion and would make the time for it. TBC: Speaking of One Love, I noticed you partner with other organizations on campus, including SGA. EA: I am the campus ambassador for One Love, and Escalation is one of their workshops. At this point, a lot of campuses have heard that workshop, which is great, but there are still others that we want to hear. We’ll be facilitating this workshop for SGA soon, which means more people are going to hear it, which is really exciting. However, we also need to start bringing some new One Love programs to campus. We are working on a facilitation group, and it’s exciting that I’m being compensated to spend time doing that. People are not just acknowledging the position, but investing in it. TBC: How will this communal effort at Butler improve or shift students’ view of sexual assault and healthy relationships on campus? EA: When I came up with this idea, I wrote a proposal and had a meeting directly with Dr. Frank Ross, vice president for student affairs, which his office then approved and funded. I think that should be really promising to students. I cannot say how it will change the view of sexual assault as a topic, but as far as the support of it, I hope that there is a bit of optimism. To me, funding me to go and do what I love was a big sign that they care about the issue. TBC: I know that you are a senior, so what do you hope to personally achieve during your year in this role? EA: The main objective is longevity and sustainability — to create enough of a system that someone could step in and continue it. I think there are disconnects on campus as far as communication. The community of C.A.R.E. is such a beautiful idea and when I say I believe in it, I really do. I think figuring out how we can all synthesize our ideas for the community of C.A.R.E. is really important. I hope that having that student perspective will help with that. I’m able to bring my perspective as well as an important perspective from the Office of Health Education and Outreach Programming to conversations that could use more of each side’s knowledge. TBC: How can fellow students get involved in your effort? When is your next workshop and what will it be covering? EA: They can come to my office hours in the Irvington BUBeWell office, which is 12:30 p.m. to 2 p.m. on Mondays and 2 p.m. to 4 p.m. on Fridays. They can also follow my social media; that’s the big thing. We are still in the process of planning our next event, but it will be with Coburn Place, a place that supports domestic violence victims. We’re calling it ‘Coburn Convos.’ It will be about dating abuse and healthy relationships, and it will be in early October. TBC: Is there anything you want to say to students who would like to meet with you, or may be hesitant to meet with you? EA: Something that is important about my position is that I am not a confidential resource for people, I am a ‘responsible employee.’ I have an obligation to report, but people can come to me, and they may not want to say what is wrong, but with my knowledge of the resources on campus I can direct them where they need to go. People also come in and just ask what I do and what Butler is doing with these issues, and because I know that so much is happening, I am really happy to provide people with that information. To learn more about Emma’s work and upcoming events, follow her on social media.